When I was growing up we would usually have Sunday dinner mid-afternoon. Dinner was, frequently, roast beef. It was a central part of my growing up. Recently I got a bee under my bonnet and thought Terry and I should have our own Sunday dinner. Terry agreed. 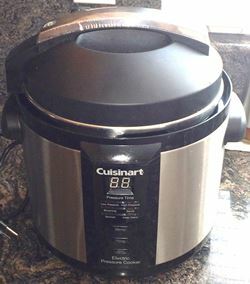 I put a spice rub on a chuck roast and cooked it in our Cuisinart CPC-6000 pressure cooker: 70 minutes plus ten minutes for natural pressure release with water and cooking port up to the level of the trivet. I boiled potatoes for mashed potatoes and Terry made the gravy. Simple. Easy. Very tasty. Terry loved it.